If I asked you to name a few marketing automation software brands, chances are you’ll name Hubspot, Marketo, Pardot or Intercom. And while these are all respectable brands with decent products, I predict another brand is going to join that list pretty soon. I’m talking about Mautic, a rising star with the power to disrupt the entire playing field. Mautic is an open source marketing automation platform that’s been lurking in the shadows for a while now, and I believe with the 2.0 release it’s ready to step into the light. Mautic is released under the GNU General Public License and is available on Github. In a sense, Mautic operates a lot like WordPress. You can get a hosted version on mautic.com, or download a self-hosted version on mautic.org. Both versions are very similar. The hosted free version on mautic.com has some limitations in terms of contacts you can create and emails you can send. There’s also a hosted pro version without limitations and professional support, but obviously, this one comes with a price tag. The self-hosted version is unrestricted and completely free. For this review, we’re going to have a look at the self-hosted version by going over the main features it has to offer. Installing and properly configuring Mautic is not too complicated, yet some technical knowledge is definitely required. If your technical skills are limited and you just want to play around with Mautic you can probably get it up and running yourself. However, if you want to use Mautic in a production environment I highly recommend getting someone involved with decent server skills. There’s a basic startup guide on mautic.org and if you get stuck you can turn to the forums or the slack channel for help. As for hosting requirements go I’d recommend a dedicated server or a cloud instance with a good amount of memory. For testing or development you could probably get away with a shared host as long you have the ability to create cron jobs. 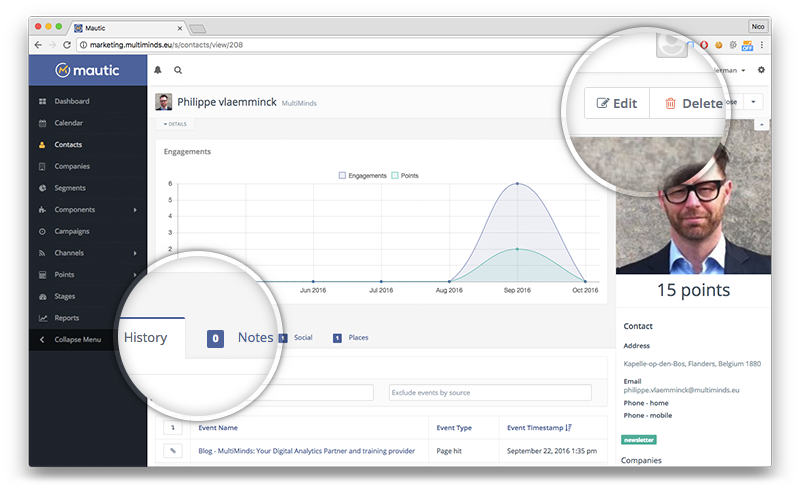 At the core of Mautic are contacts, it operates like a basic CRM. 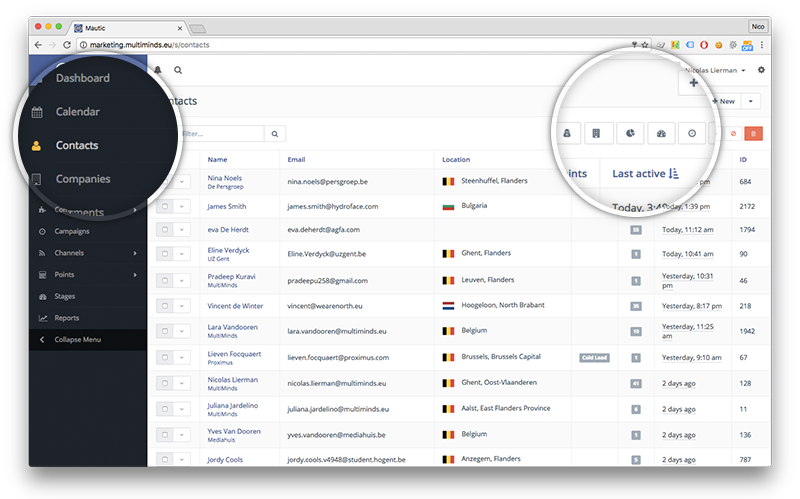 If you’re already using a dedicated CRM Mautic can sync with such services like Salesforce or Zoho, but if you don’t, Mautic’s contacts is a solid solution to start building and managing leads. After installing Mautic’s tracking script on your website, it will monitor all visitors and keep a history of all the pages they visit and the actions they perform. 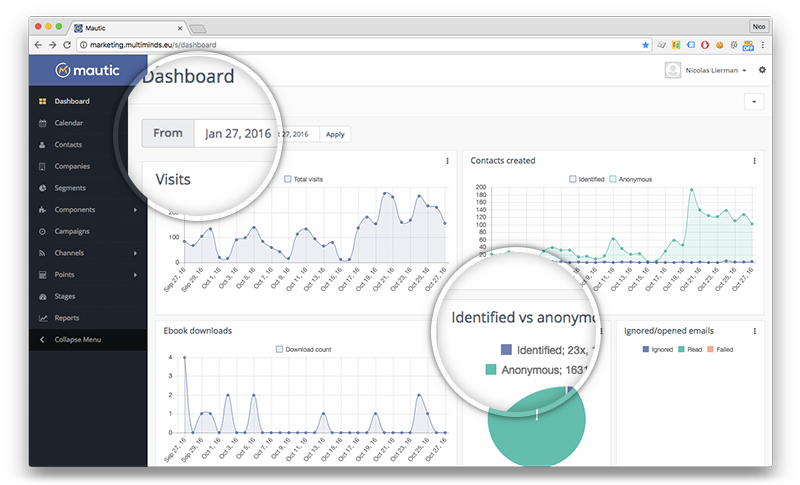 When a visitor submits a form or downloads an asset Mautic will use that information to identify the anonymous visitor as a contact. These contacts can subsequently be used in your campaigns. Managing your contacts is easy. 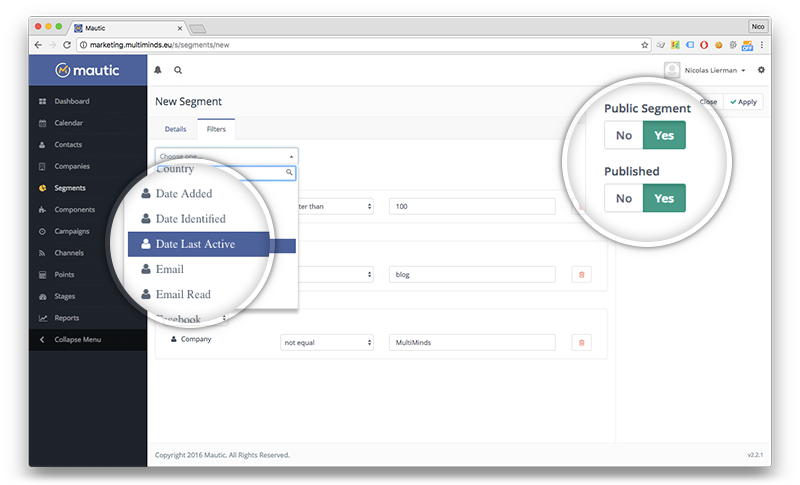 From the contacts overview, you can directly add contacts to different segments or assign a sales stage. The contact detail view has a detailed history, an engagement chart and displays all the information you’ve gathered on that contact. You can see what campaign the contact is part of, which emails the contact has received/read or what content the contact has viewed or downloaded. You can manually edit or enrich all information and if the contact’s social profiles are known you can view their feeds. There are a few other ways to add or manage contacts as well. If you already have a list of leads you’d like to work with you can add them manually or import the entire list in CSV format. Another great feature is identifying contacts with the Mautic tracking script. If you’re site already has a registration/login or if you’re using another form builder, you can integrate these using the Mautic Tracking Script. Segments are a way to organise contacts in different groups. You can manually add contacts to different segments, but the real power is in the way Mautic can automatically add contacts to segments based on their actions, behaviour or information. These segments are the cornerstone of building your campaigns and allow you to target very specific groups of contacts. At the heart and soul of every marketing automation platform are campaigns. Mautic comes with a visual campaign builder that allows you to select and connect different building blocks to create a fully automated flow. The source of each campaign has to be either a segment or a form. After selecting a source for your campaign you can start mapping it out by connection actions, decisions and conditions. This is something Mautic does really well, and it’s easy to get the hang of it. A campaign action can be something like sending an email or a text message or modifying the contact’s information. Decisions are triggers when a contact takes action. That could be opening an email, submitting a form or visiting a page. Conditions are pretty straight forward and can be set to the contact’s information or form results. Possibilities are endless and it helps to have a clear strategy in mind before launching the campaign builder. For campaigns, it is important to setup the required cron jobs correctly. The way you configure these cron jobs directly impact when segments are evaluated and campaign actions are triggered. You also have the option to either directly send emails or put emails in a queue to send out later. Mautic comes with a number of tools to build and identify your audience. Two of those are forms and landing pages. As they are used to gather user information, forms are an integral part of any marketing automation system. In Mautic forms can be used as the source of a campaign or as a standalone form to feed your segments. You create a form by selecting a number of built-in form elements and dragging them in the right order. After you finished creating your form you can attach one or more actions to it. These actions are executed after a form is submitted and allow you to email form results, adjust the user’s segments or points, modify tags or download an asset. Mautic pages are a way to quickly create compelling content with landing pages that integrate nicely into your website. One of the great advantages of the self-hosted version of Mautic is that your landing pages aren’t hosted on the third-party server. Basic pages are easily created with the page builder and there’re even a couple of themes you can use, but in a production environment, you’ll probably import your own HTML. Landing pages have multi-lingual support and you can even create a number of variants for A/B testing. However, if you have your own CMS you’re not obligated to use this feature as Mautic will play nice with landing pages you create outside the system as well. Channels in Mautic define how you engage with your audience. The primary channel, of course, is email. There are two different emails types of emails in Mautic: segment emails and template emails. Segment emails are your usual newsletter emails that can be sent on-off to a specific segment and cannot be edited afterwards. Template emails are used by campaigns, forms and triggers. These template emails are the building blocks for your automated drip campaigns. 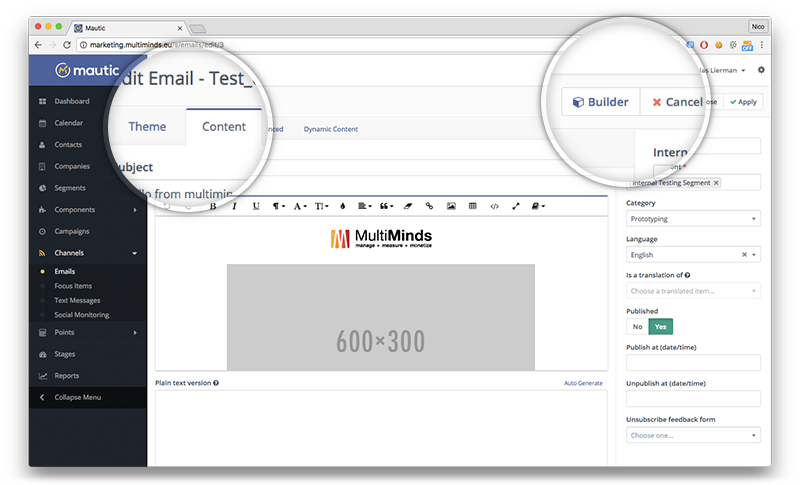 To create your emails you either copy your template you created outside Mautic or you use the email builder and design your email with drag and drop elements. To create a consistent user experience, you can also use Mautic’s theme system and apply any of the existing themes or create your own. Mautic emails also support localisation to different languages and A/B testing. 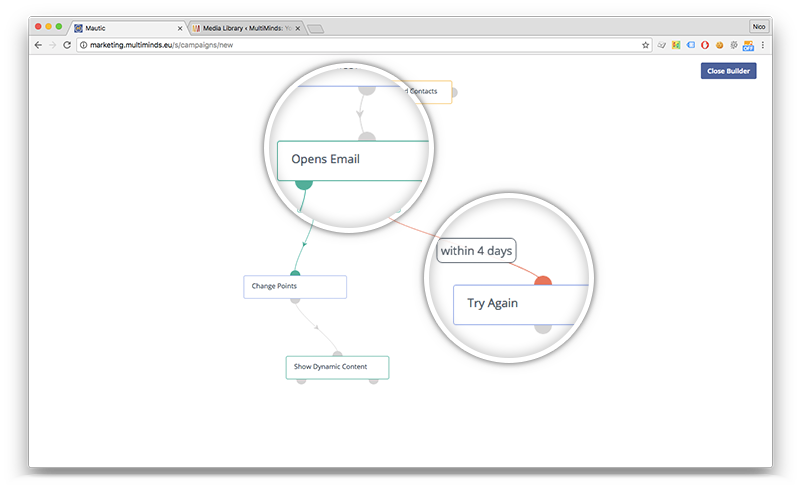 Mautic supports a variety of ways to actually send your emails. For testing, you can use your server’s mail function, your Gmail account or your own SMTP server. For production environments it is advised to use one of the available integrations such as Mandrill, SendGrid or Amazon SES. You can also set frequency rules to not overload contacts and there are options to monitor bounces as well. Other channels include text messaging, focus items and social. Text messaging requires a Twilio account and after you connect your accounts you can have your campaigns send out text messages to your contacts. 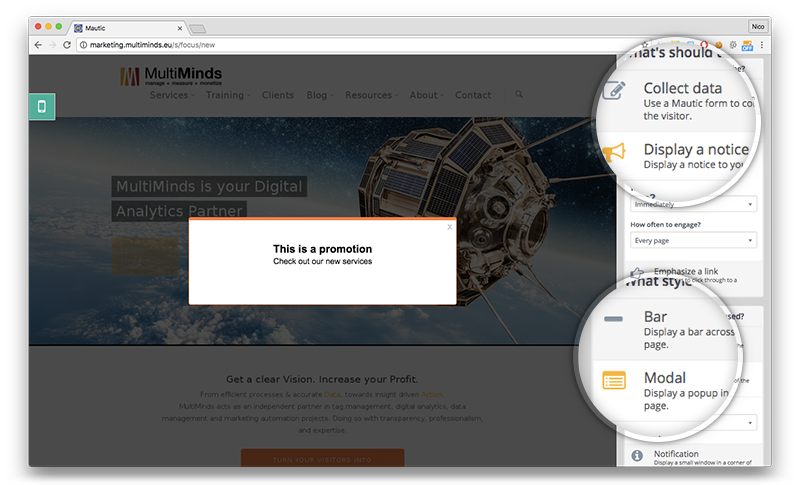 Focus items is a brand new feature that allows you to display in-site notifications and pop-ups to your contacts. Finally, with the social channel integration, you can send out tweets to your contacts. 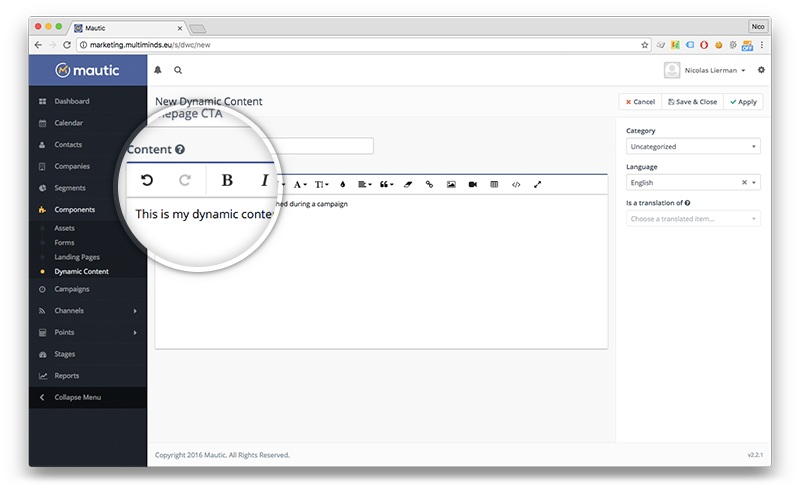 A feature that’s been recently added to the Mautic toolkit is “Dynamic content”. And while this feature still feels a bit rough around the edges, it holds great promise for the platform. Dynamic content allows you to display targeted or personalised content on your web pages or campaign emails. It works by creating alternate versions of certain content and overwriting the default content based on campaign actions and triggers. You can use dynamic content both with anonymous and known contacts and just like with pages and emails it also support translated content. Lead scoring is an essential part of creating a cost-efficient marketing strategy. Mautic provides a way of doing this with a point system. Points are used to create a proper weight for each contact and can both have triggers and actions attached. Actions are a way to change a contact’s total points and can have a negative or a positive impact. For example: when a contact downloads an asset you could add 5 points to his/her total. Triggers, on the other hand, are executed when a contact’s points change. A common scenario would be to push a contact to a certain segment when the contact reaches a minimum number of points. A more top-level approach to lead scoring in Mautic is to assign stages to your contacts. These should reflect your marketing stages and help you to define the lifecycle of a contact. This feature is relatively new and at the time of writing the possibilities are limited. You can manually add a contact to a certain stage or have your campaigns move your contacts between stages. When you log into Mautic and haven’t changed any of the default settings, you will land on the dashboard view. The great thing about this dashboard is that is fully customisable. Dashboard widgets can be removed, and new widgets can be configured and added. The default dashboard is a bit open-ended and by customising the dashboard you can immediately focus on your business objectives and set some relevant KPI’s. It also makes sense that the main dashboard is configured at the user level, so users in other roles might have a totally different dashboard. Aside from the main dashboard Mautic also has a dedicated reporting section. It comes with a number of pre-configured reports to get you started, but the idea here is that you create your own custom reports based on your own marketing automation strategy. These custom reports are not as straight forward to configure as the main dashboard and require some effort getting used to. It’s certainly an area where Mautic can improve. One of the key long-term advantages Mautic has is it’s plugin architecture. At the time of writing this review, there are already a decent number of plugins available. Most of these plugins allow you to connect with a third party CRM or email system, or integrate a social channel. The most prolific services Mautic supports today are Facebook, Gmail, hubspot, Instagram, MailChimp, salesforce, Twitter and Zoho. 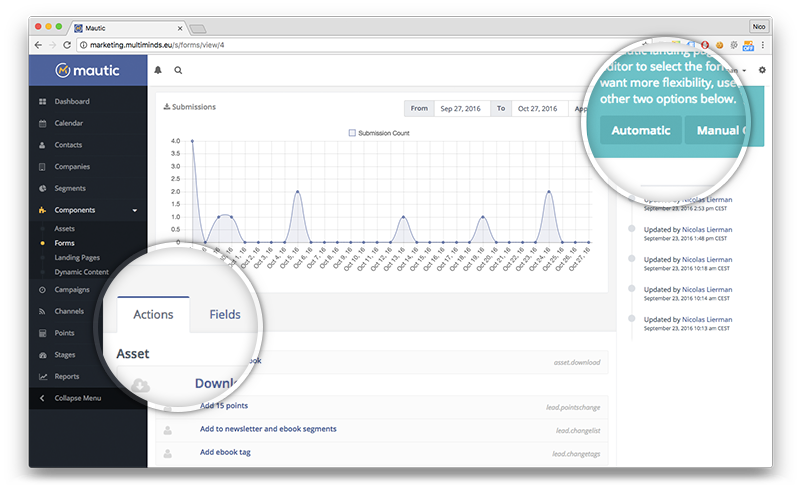 Mautic also has a REST API and webhook functionality that allows for custom integrations. The REST API is well documented and opens up many possibilities to integrate Mautic into your own tech stack. Web-hooks, on the other hand, are a great tool to setup quick one-way integrations. All in all, Mautic has a lot of reasons to be excited about the platform. At MultiMinds we’ve been using Mautic for a couple of months now, and while we just started to use it we’re already seeing how it’s transforming our inbound marketing strategy. Like all marketing automation platforms, it does require some work and careful consideration on how to draw out your inbound strategy, but with the zero start-up cost of Mautic investing that time is worth it. As of today, we feel Mautic is on the brink of breaking through as a mainstream marketing automation solution that’s ready to compete with the big brands. There’s nothing holding you back installing Mautic yourself and giving it a test drive, and even in a production environment, we feel it’s ready to hold its own. Not to say there will be small hiccups here and there, but if you have the technical skill to setup Mautic you’re also capable of dealing with some of the minor growing pains. If you’d like to integrate Mautic into your business, but you don’t feel brave enough to do it yourself, we at MultiMinds are happy to help you out and lend you our expertise. Just drop us a note.